Located in the city of Fuente Ovejuna, in the Guadiato Valley (Córdoba, Spain), the Monte Olivete estate is found, where three generations of the Calaveruela family, named for the hill on the estate, have worked in agriculture and farming. In 1980 they began manufacturing cheeses and other dairy products, growing cereals and feed for their own sheep, controlling the whole production cycle. Quesería Calaveruela thereby guarantees the production of its raw materials, obtaining milk from its own livestock. 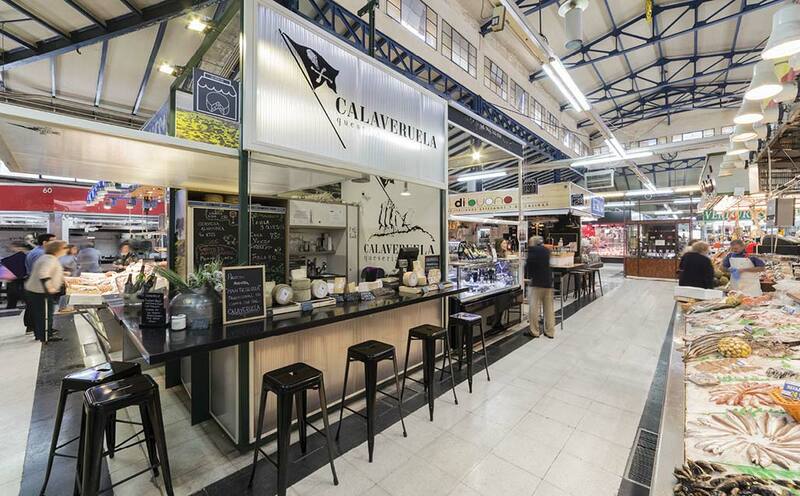 There are three points of sale of the traditional products of Calaveruela: its own installations in La Coronada and the Abastos de Fuente Ovejuna market, both in the province of Córdoba, and at stall 22 of the Vallehermoso Market in Madrid. In the latter we find the solid surface from PORCELANOSA Group, KRION, in the 6901 Black Metal colour. The KRION transforming company, KUMA Estructuras, S.L., was in charge of creating this black, L-shaped counter.